Direct waterfront in sought after East Norwalk Vantage Point complex. Water views from most rooms. Glorious sunsets and cool summer breezes from your 25' Teak balcony easily accessed thru sliders from LR/Den & Master en suite overlooking harbor and Long Island Sound. Walk/bike to all East Norwalk amenities and SoNo attractions & night life. Tax record says 2 BR, however wall can easily be put back and converted back to 3 BRs. Updated master bath, radiant heated flooring in LR. Minutes to I-95 & Merritt Pwy. 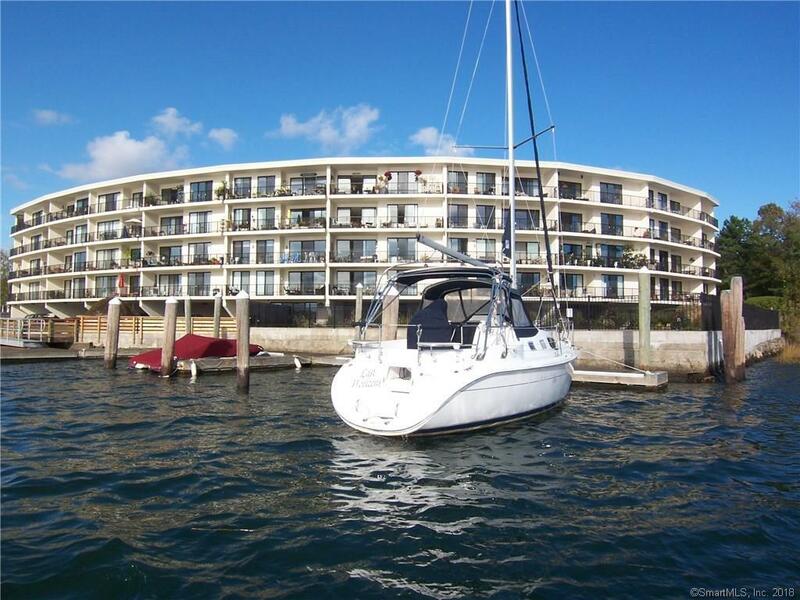 Community room, in-ground heated pool, marina & dock promenade. Great commuter location 50 miles north of Manhattan. Minutes to East, South Norwalk and Westport train stations. Large storage room/reserved carport parking. Come enjoy the lifestyle of 06855 - Live the good life! Storage unit S12 w/reserved parking in front of unit. NO STEPS & Secure/elevator building. Seller would like to leave Master BR furniture & 2nd BR wall unit. Please be sure to read confidential agent remarks., NO STEPS! Direct waterfront in sought after East Norwalk Vantage Point complex. Secure/elevator building. Water views from most rooms. Glorious sunsets and cool summer breezes from your 25' Teak balcony easily accessed thru sliders from LR/Den & Mstr en suite overlooking harbor and Long Island Sound. Walk/bike to all East Norwalk amenities and SoNo attractions & night life. Tax record says 2 BR, however wall can easily be put back and converted back to 3 BRs. Updated master bath, radiant heated flooring in LR. Minutes to I-95 & Merritt Pwy. Community room, in-ground heated pool, marina & dock promenade. Great commuter location 50 miles north of Manhattan. Minutes to East, South Norwalk and Westport train stations. Large storage room/reserved carport parking. Come enjoy the lifestyle of 06855 - Live the good life! Storage unit #S12 w/reserved parking in front of storage unit. Seller would like to leave Master BR furniture & 2nd BR wall unit.